Using data from radio and millimeter observations of GRB 130427A, CfA astronomers have confirmed the signature of the reverse shock in GRB 130427A, and determined the characteristic velocity of the ejecta as being 99.997% of the speed of light. 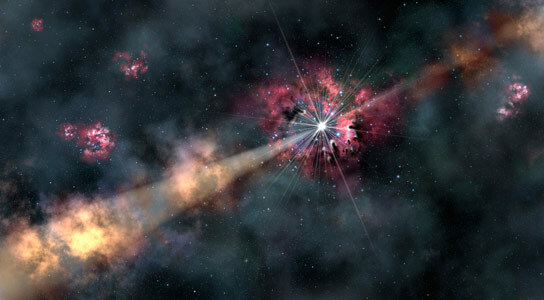 Gamma ray bursts (GRBs) are the brightest events in the known universe. These flashes of high-energy light occur about once a day, randomly, from around the sky. While a burst is underway, it is many millions of times brighter than an entire galaxy. Astronomers are anxious to decipher their nature not only because of their dramatic energetics, but also because their tremendous brightnesses enables them to be seen across cosmological distances and times, providing windows into the young universe. The somewhat longer lasting variety of GRB is associated with the death of massive stars. The details of these bursts reflect the nature of the progenitor stars, the structure of the explosion environment, and the composition of the ejecta. Even after the explosion ends, the powerful ejecta generate an afterglow that can be analyzed as the particles plow into the circumstellar material around the progenitor star. Studies of the afterglow find two light signatures: one produced when a forward moving shock slams into the material, and a second kind resulting when a backward moving shock (the “reverse shock”) is produced (roughly similar to the way a water wave, encountering an obstacle, spawns a backward moving wave). Both the forward and reverse shocks reveal different details of the cataclysm; the reverse shock is a particularly valuable probe of particle velocities in the burst. Although in the past there have been some diagnostic hints found of a reverse shock in the radiation, the conclusions were indecisive because they lacked a full decomposition of the radiation into both its forward and reverse components. Each of these components radiates over a very broad band of wavelengths, with each kind if shock characterized by a distinct intensity peak at a different wavelength band. One problem has been that observations over the full range from optical to radio are needed to sort things out, but there is very little time during a burst to collect all the data. CfA astronomers Tanmoy Laskar, Edo Berger, Bevin Zauderer, Raffaella Margutti, Alicia Soloderberg, Sayan Chakraborti, Ragnhild Lunnan, and Ryan Chornock and two colleagues present extensive observations of a burst that occurred on April 27. They obtained data from radio and submillimeter wavelengths through the infrared, optical, ultraviolet, and X-rays, and all in the short period from 0.67 days to 12 days after the burst. Their careful analysis convincingly finds the signature of the reverse shock, and determines the characteristic velocity of the ejecta as being 99.997% of the speed of light – very fast indeed. This benchmark dataset offers a so-far unique view of the reverse shock, helps to confirm theoretical models, and illustrates to power of detailed, multi-wavelength modeling of GRBs. 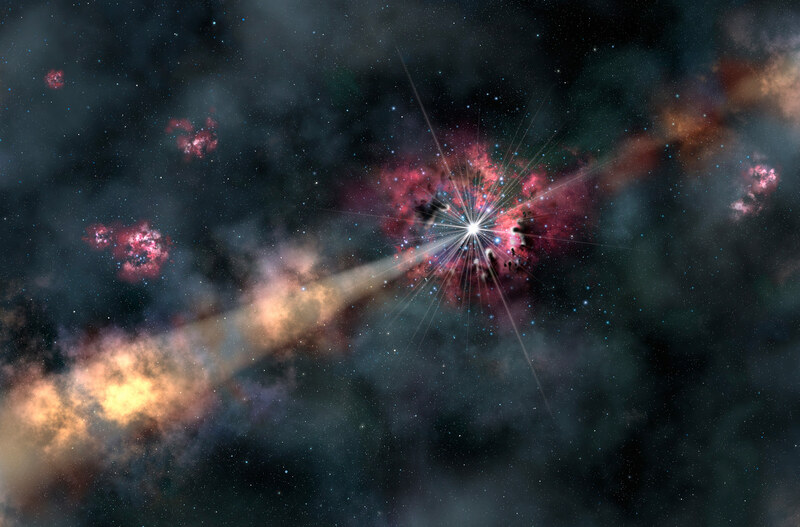 Be the first to comment on "Astronomers Confirm a Reverse Shock in Gamma Ray Burst 130427A"